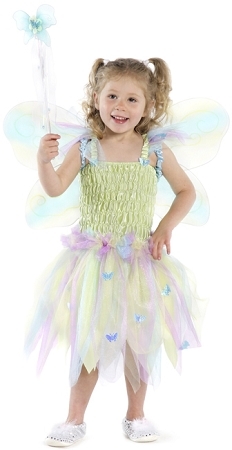 Butterfly Fairy Princess Dress is one of favorite little princesses dress. This dress features a rouched satin top (expands for more flexible sizing), with soft tulle petals on the straps. Blue Butterflies are scattered throughout the skirt, which is a fairy-like grouping of multi-coloured tulle. This outfit also comes with a blue butterfly wand, & wings. The wings have a satin covering for the arms, so the elastic is non-scratch kid-friendly.